New English and language arts intervention specialist Meredith Heber works at her desk in Dempsey Middle School Tuesday. 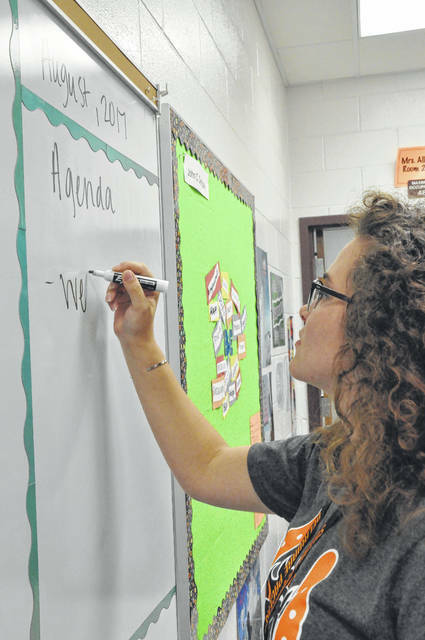 Heber writes the agenda for the first day of school on the board Tuesday afternoon at Dempsey Middle School, where she was a student just eight years ago. Eight years ago Meredith Heber was a eighth grader at Dempsey Middle School, but as of today, she’ll walk the same halls as an English intervention specialist. 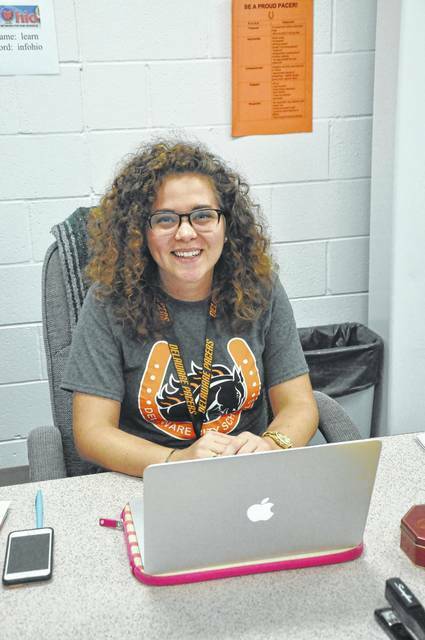 Heber graduated from Bowling Green State University in May and was offered a job as seventh-grade English and language arts intervention specialist. The Delaware City Schools alumna said she was drawn back to Delaware because of the district’s commitment to fostering positive relationships with students. Another plus was learning that one of her former teachers is now the principal at Dempsey, Heber noted. While it’s been strange returning to Dempsey as a teacher, Heber said she was excited to begin the school year. Even though it’s only been eight years, Heber said so much has changed at the school, especially technology. One of Heber’s favorite memories was doing labs in Megan Pollock’s science class. She said it’s very strange to now be colleagues with her former teachers. “It’s a feeling I’ve never really experienced before, but I’m very grateful to have such a unique opportunity,” Heber said. “It means so much to me to have the people who invested so much into my life, teachers and administrators who were here when I was a student, and now to be on the other side, it almost brings my experience as an educator full circle. Heber said she is looking forward to meeting her students today and forming relationships and creating bonds with the community. “I am not only here to teach, but I’m here to value the lives of children and of individuals in this community, of which I’m so fond of and have such a special place in my heart for growing up here,” Heber said.